Updated – 06/01/2016 – We are into our 30th year and Karl and Lydia have retired. They moved to Florida to enjoy life and spend some free time relaxing. April 1st is Gamka’s 29th Anniversary !!! Happy 29th Anniversary to Gamka – Thanks for the History. We would like to thank all our loyal customers for making this possible! We are very fortunate and we look forward to many more. Gamka’s history starts back in 1953, a young, energetic man named Karl J. Weiss emigrated to the United States from Germany. Good fortune followed: he promptly landed a job at Contractors Supply, a construction product distributor in Northern New Jersey, and he met a beautiful young lady by the name of Lydia. She was to become the true love of his life. A lifetime career in the distribution of construction products runs a close second. Like the weather, things often change unexpectedly. After working at Contractors Supply for only six months Uncle Sam called. Karl was drafted into the United States Army to serve his new homeland for the next two years. After his discharge from the Army in January of 1956 he returned to his position at Contractors Supply. It was then that Karl’s life got busier! Later that year he and Lydia were married and started their family. They have two daughters, Irene and Linda, and two sons, Karl W. (known as J.R.) and Ronald. Karl dedicated himself to the construction supply and equipment distribution business for the next three decades, learning all the “tricks of the trade”. Starting in sales, he climbed the ladder to become manager of the entire New Jersey operation. Then, after more than thirty years of working for someone else, he decided to branch out on his own. Karl was never known to be as a man afraid of taking a chance and this was a well-calculated risk. 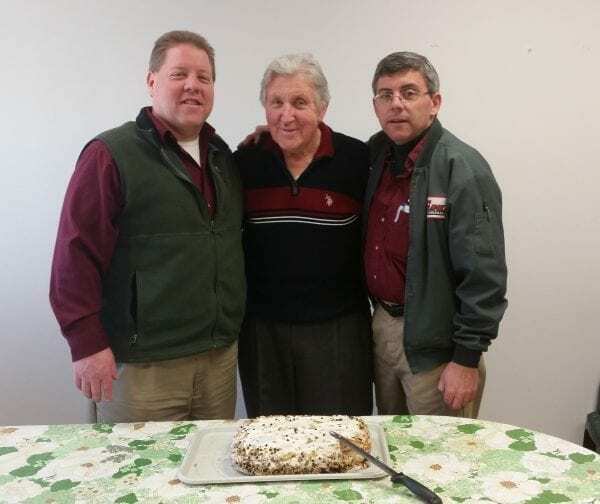 Gamka Sales Co. Inc. was established in April 1986 at a modest 2,500 square foot facility in Edison, New Jersey by Karl Weiss and his eldest son, JR. Ronnie, Karl’s other son, soon joined the organization. Karl banked upon his vast knowledge, the assistance of his oldest son J.R. and some outside financial capital to get up and running. Many people ask how the name GAMKA came about. Karl’s backers were Gerry, Anthony, and Michael. They were the G,A and M. The KA is for Karl. The three backers were paid off in a short time and Gamka has been 100% owned and operated exclusively by the Weiss family for years now. The company rapidly outgrew its birthplace and two others, all in Edison. History flies by fast it seems. This geographic location was chosen as it is central to servicing contractors working anywhere in the state and just a stone’s throw from the New Jersey Turnpike, Garden State Parkway, Interstate 287 and Routes 1, 9 and 18, etc. In 2002, Gamka again relocated within Edison to a 60,000 square foot, climate controlled warehouse with offices and showroom on six acres. Inside are more than 40,000 line items including light to medium sized equipment (from a drill to an excavator), construction chemicals, construction hardware, construction supplies, concrete tools and over 1,900 pieces of rental machinery. There are parts in stock for the equipment lines sold. Gamka’s service department maintains what Gamka sells with a complete shop and a half dozen factory trained technicians. So now you know a little more about Gamka’s history and how we started. We thank you for reading and look forward to servicing you. Feel free to contact the owners at 732-248-1400.